So this past weekend, I had an amazing community service opportunity with my program here in Valparaiso, and could not wait to share it with you! I defiantly would say it is one of my favorite things I’ve done in these past five weeks in Chile! 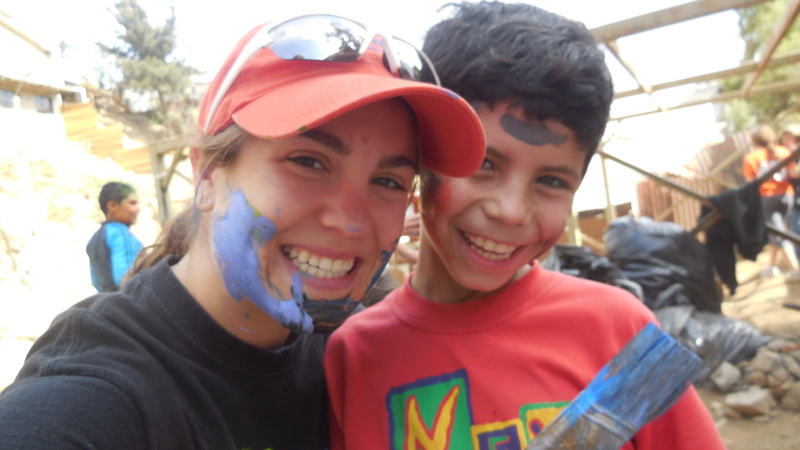 SIT is a study abroad program that is sort of unique in that we are not directly enrolled in a university, but participate in tons of cultural excursions and community service opportunities. Our first community service project was this past weekend in Cerro Rodelillo (Cerros are the neighborhoods that make up Valparaiso.) 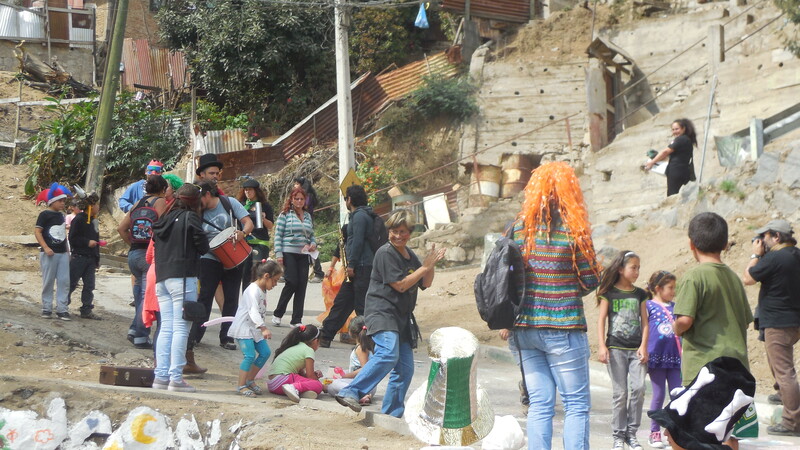 This cerro in particular is home to a largely lower-class population, where many of the houses are made from scrap metal and children play in streets glittering in glass. Its defiantly not where the city tour buses will take you. More recently, on feb 14th, 2013, Cerro Rodelillo was the site of one of the most massive fires in Valparaiso in fifty or so years. Hundreds of houses were completely burnt down, many losing all of their material possessions. 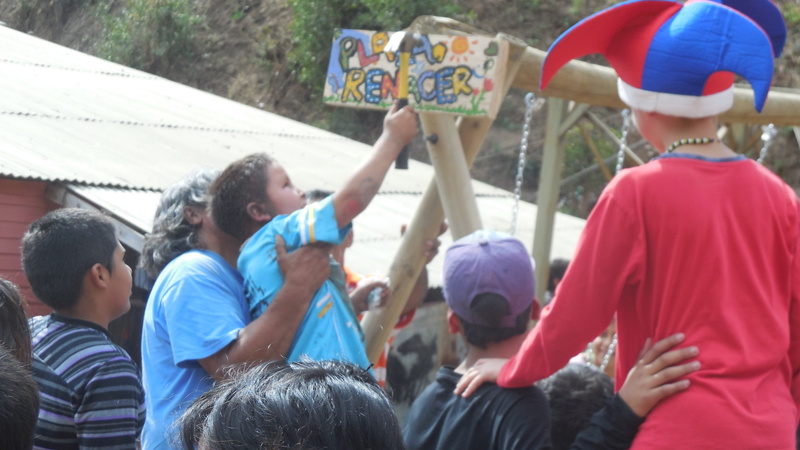 Our job in cerro Rodelillo was not to rebuild every demolished house nor solve its the economic hardships. It was much simpler…and larger than that. As a group we cleaned and re-purposed a tiny space, a “plaza” . This dusty plaza was not only where kids could play soccer and swing, but where the community could now come together and start anew. 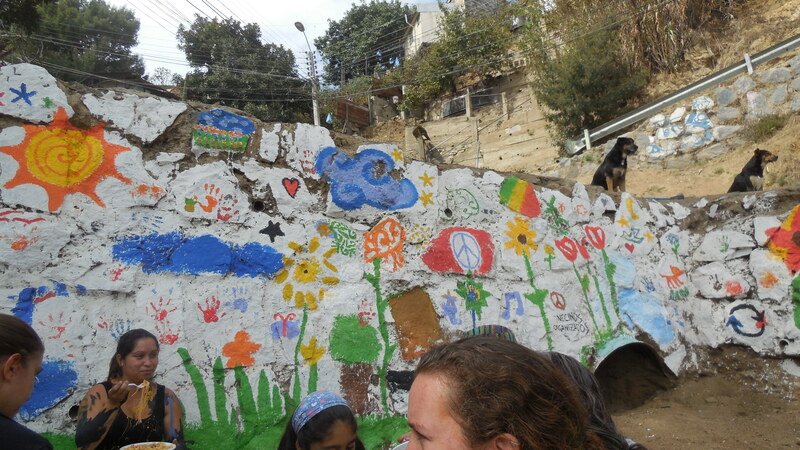 On Friday, our group of 25 gringos split up in several groups; some were assigned to clean and prepare the rock wall for mural painting the next day while others played with the kids that congregated there. When the work was finished we hopped on a “micro” (bus) and back to our homes where we showered with running water and ate the “once” * our Chilean moms had prepared for us. 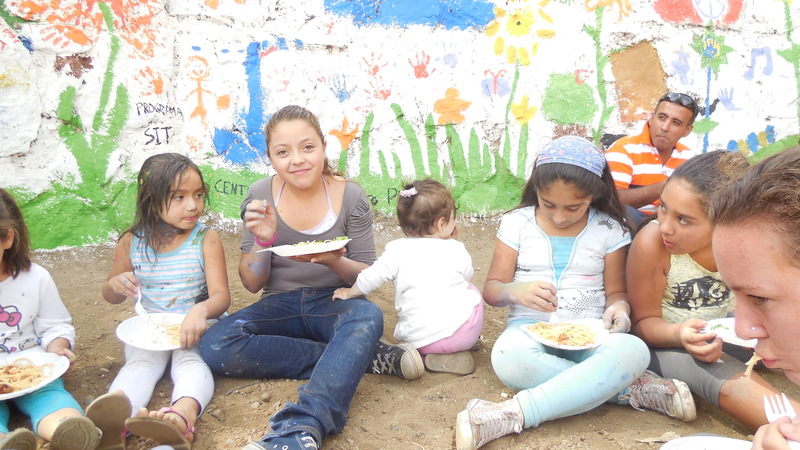 After the painting session, a few of us walked up to a house that had prepared food for the whole community as part of the celebration of the “opening” of the plaza. This “house” was partly burnt to the ground by the fire, tarp walls surrounded the small kitchen area, and a Chilean flag flying above. Inside, an aproned woman inside two huge pots full of spaghetti, lettuce, and tomatoes for us to bring to the plaza. And there we sat the new found plaza, eating, laughing with kids, and conversing with moms and holding their babies. After lunch, there was a mini parade with live music, face painting, and goody bags. The community also decided on the plaza name: Plaza Renacer, which means “rebirth”, foreshadowing the new life this plaza would bring to the area after a huge tragedy.